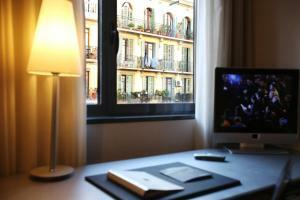 Hotel Vilamarí is set 250 metres from Plaza de Espanya Metro Station and the Fira de Barcelona Exhibition Centre. This design hotel features a terrace and a small gym with Turkish Bath. The Vilamarí’s air-conditioned rooms have simple, elegant décor and dark wood furniture. 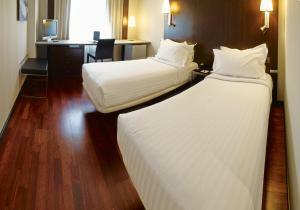 Each room includes flat-screen satellite TV and a minibar with free water. 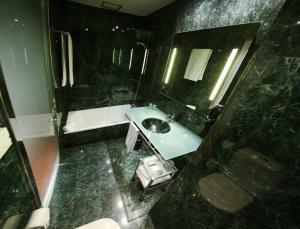 The stylish bathrooms come with amenities and a hairdryer. Barcelona’s MNAC Art Museum and the Magic Fountains are within a 10-minute walk of the hotel. Las Arenas Shopping Centre is just 200 metres away. Barcelona Port is a 15-minute metro ride away and Barcelona Beach can be reached in 35 minutes. The hotel’s restaurant offers modern versions of traditional Catalan cuisine. Guests can enjoy meals or drinks outside on the terrace. 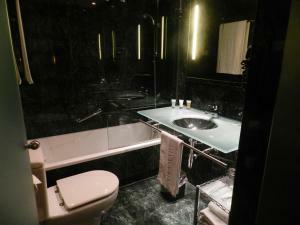 The hotel also has a café-bar and 24-hour room service. Please note that half-board rates include a limited menu. Please inform Hotel Vilamarí in advance of your expected arrival time. You can use the Special Requests box when booking, or contact the property directly with the contact details provided in your confirmation. 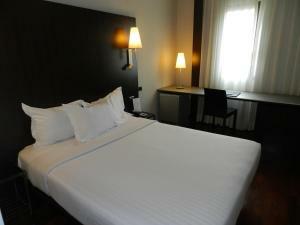 This air-conditioned room features a free minibar and flat-screen satellite TV. Some of the rooms look onto the courtyard and others onto Calle Vilamarí. This single room has air conditioning, satellite TV and minibar. This room has 1 double bed, minibar, air conditioning and satellite TV. Please note, the maximum capacity of this room is 2 people, including children and babies. Rate: € 75.24 ... € 195.80; select dates below to get current rates. This twin room has a satellite TV, air conditioning and minibar.